We are not building much new transportation in the US not just because the costs are too high, but because the benefits are too low. My 2011 post Transportation Costs Too Much made the claim that new projects were too expensive, and listed a series of hypotheses as to why that might be the case. The whole list is collected here. The first 3 data points on the graph are rates of return from their work, the last is an extrapolation. This is illustrative only,but someone should update their study. My guess is that the 2000s are significantly lower. A value of approximately zero returns in recent years is consistent with recent work by Noland and his colleagues. This is what you expect with life-cycle theory, and it applies well to existing modes. The reason we don’t draw new lines on the map is that the net benefits are not perceived to outweigh the net costs. The costs have risen as land has gotten scarcer and for all the reasons linked above, and the benefits of additional lines drop. Here we explore the second point. Diminishing marginal returns to new roads due to diminishing distance reductions as the network is increasingly complete. 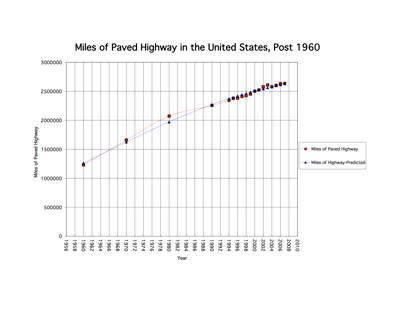 This is a spatial argument, illustrated in the Third Figure (Source: Figure 27.4 from The Transportation Experience). Imagine you have a network with a 1 mile grid (typical for much of the US). With development of farms, you add roads in between, say at 1/2 mile spacing, this reduces travel costs some, as people don’t need to back-track as much, and this might be a significant share of the distance for short trips. At most, you are saving someone 1 mile (1/2 mile at the beginning of the trip, and 1/2 mile at the end of the trip). Now add additional links to diminish spacing to 1/4, This requires twice as many links, but only reduces travel costs by at most 1/4 mile at each end of the trip (1/2 mile total). New links do less and less to reduce distances. Distances, along with speed, determine travel time. Thus we have to discount the opening year forecast travel time benefits to account for the fact that the travel time savings of any expansion will in part (if not in whole) be eaten up by more travel. While this is not of itself a bad (travel is a measure of people doing something that they value), it is not perceived to be a good thing (because it creates congestion and pollution externalities which existing travelers bear). There is some compensation for induced demand and induced development, as more travelers may lead to more service (induced expansion of existing links and construction of new links), but this is a longer term process, and only works up to a point (and more easily with transit services than roads). 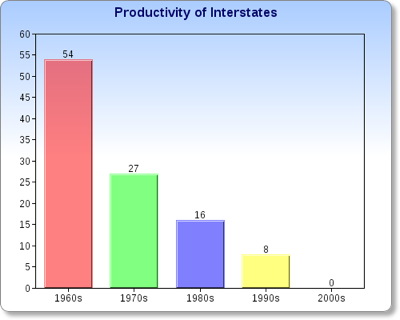 slowed population growth, particularly in un-roaded or under-roaded exurban areas. Implies the benefits from new construction are falling. The saying goes: Fast, Cheap, or Good, pick any two. It sometimes seems we have none of these. We know transport costs too much. We know transport takes too long to build. Surely if we are paying a premium, it should be of high quality. It seems not. Maybe the few facilities which are brand new, expensive, and took too long to build are, but the rest of it is not. Even then, I have doubts. Big Dig Ceiling Collapse is one of many notable failures, this one all the worse because the facility was new and expensive.An earlier post, It Just Makes You Feel Poor describes the poor quality environment around some local new LRT stations. The arguments about benefits apply to mature systems in general, and are modally independent. If a new mode comes about that is better than existing modes for some market, it has lots of room to run while providing benefits in excess of costs. But if the new mode is inferior to existing modes, than it has little in the way of prospects. What constitutes better or inferior is in the eyes of the customer. Certainly customers care about time and price, but they do also consider quality, and may be willing to sacrifice one for the other. But as experience with zeppelins and cruise ships (and conventional intercity rail in most of the US) show, high comfort at slow speed will not trump low comfort at high speed. This also has implications for the Preservation vs. Expansion argument (Fix It First). If the old projects had high benefit/cost ratios, and without proper maintenance are at risk of disappearing (either failing catastrophically, or being closed to prevent such an end), it is incumbent to maintain them. In fact, given that land uses and resultant activity patterns that have evolved around transportation networks, the benefit/cost ratio of preserving those links is probably much higher than it was originally, and certainly higher than the B/C of new links. For reasons mentioned in a previous post, we got a new car. I had been hoping my next car would be self-driving, but that was not to be. The new car needed to be bigger than the previous as we have 3 children who sometimes all need to be transported. The Subaru Forester and similar sized cars are incapable of carrying three children in the back row in three car seats (which is what the law requires in some states, seriously the car seat lobby must be making a fortune on fear-mongering). This requires 3 rows. After filtering for size of car, we considered the Dodge Durango, GMC Acadia, Ford Flex, Honda Odyssey, Honda Pilot, and Toyota Siena. Nissan was out of the running based on previous quality issues (damn poor Sentry that stalled out at intersections), and in the end that did in GM as well (damn poor Chevette that leaked over the driver’s foot when it rained, because water accumulated in the vents). Based on quality of ride and build, and reliability (both perceived and real), and the fact that I would not want to be in a minivan, we wound up with the Pilot, which we have nicknamed Menace 2 Society. 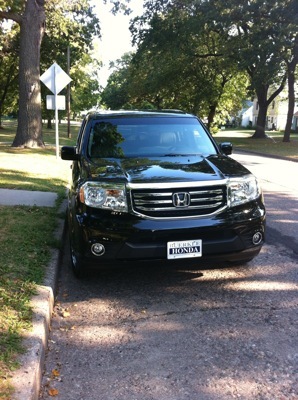 The car buying experience was not great (I purchased at Buerkle (pronounced Berkeley) Honda). The salesman let me do a short test drive, I would have preferred to be longer. They had their best price. I asked for lower. They had their Costco price. I asked for lower. They said ok to a lower price (take that Costco price guarantee). I probably could have pushed them more, but I didn’t have all day, and didn’t want to come back (since I was in a daily rental from Enterprise). But then they had their financing people. I chose to finance primarily because I don’t carry around that much cash, but interest rates are so freakin’ low it would make sense in any case. Strangely the finance people also sell the service contracts. I don’t have special fondness for dealer service (though they are usually fine in my experience, if pricey), but I like to make one organization responsible for everything so there is a minimum of finger pointing. It seems break-even in costs, based on history with previous cars, though they get some money in advance, but like I said, the interest rates are really low. They also sell the undercoating/rust proofing after-market. There is controversy about this, some say it is like mattress protection, and too expensive or worthless. I plan on holding the car a long time assuming it doesn’t break, crash, or the price of gas doesn’t go about $10/gallon, so I am interested in long term preservation. My last car was held 14 years, and after treatment did not rust (but was beginning to rust beforehand at edges with scratches.) At any rate, they sold as a package and it is hard to decompose how much it is for each item. There is an insurance aspect to this, hoping I won’t use it, but if something goes wrong in the first 8 years, they can be held accountable. As part of their service contract, they include a contracted service (Honda Care Roadside Assistance via Cross-Country Motor Club) that is like AAA for stranded cars etc. Good luck finding them though, this is not information they want you to have, or a service they want you to use (since you already paid for it, using it is a cost to them without future revenue.) In some ways I want to test it, and see if it works. I worry though that if I call them I will get a “no one is home” message. We are still AAA members from last season, I am debating re-upping. Why would this be? Was your server taken over by spammers? Can you not fix this properly? Second, once you sign up for electronic payments, they don’t actually debit the first payment, only the second. Again, why? Then, since you didn’t make your first payment (assuming naively that since you signed up, they could deal with it), they send bill collectors after you. Wouldn’t it be cheaper to just take the money that was offered the first time. There are so many buttons and dials on the dashboard, if only they had voice control. It does, but it is voice control c. 1998 automated phone tree. You have to push a button, and then wait so long for it to tell you what you can do you have already reached your destinations. I complained about it in the test drive, and the salesman tried to explain that it wasn’t the most god-awful terrible piece of crap user interface (or something like that which I muttered), but really, this was a 2012 model, not a 1998 model. 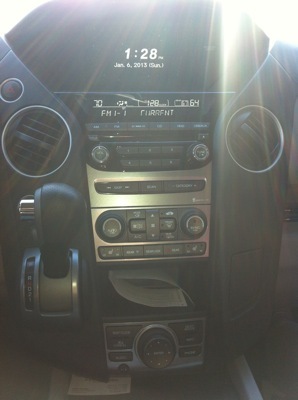 The buttons are sort of randomly placed, environmental controls sandwiched between the radio and the navigation system. The problem is keeping your eye on the road and hitting the right button. I don’t have a solution, but I am sure Apple would. Start with fewer buttons, or maybe a touch screen that only gives you controls in the right mode (environment, entertainment, navigation, communications, car statistics, whatever), or maybe a good voice control that actually does what you tell it to. The GPS is generally accurate in my limited experience, and not too intrusive, but programming it for the destination you want is a pain. Again touch screen would be really nice here. Give me a map, let me point to where I want to go, and then you find the best path from here to there. Or a smart voice control that could understand what I said at a normal rate of speech. I periodically get surveys from someone on behalf of Honda about whether I would recommend it to a friend or family member. Thus far aside from the UI, I am happy with it, but as the saying goes, YMMV. In short, I have turned comments off on this website. Since the middle of our brief sojourn in the 21st century, social media has exploded. Facebook has peaked (by which I mean, of course, my use of it has peaked), Twitter is still on the rise (by which I mean, my use is continuing to increase). Overall we may have passed Peak Blog (although we just may be in the Trough of Disillusionment). Many people read this blog from an RSS feed (usually Google reader or some frontend for Google reader: I use Reeder on the iPhone and PerfectRSS on the iPad and Google Reader on my computers). Others see posts on Twitter. Some actually come to the blog website itself. A very small fraction post comments. A slightly larger fraction see them (those who click to comment themselves, or come to the blog via Twitter, but not those who read it on RSS or even the website, since unless you are sharing the post, or explicitly want to read comments, there is no reason to click through to the page). I wish everyone would just use RSS to read links and we could be done with it. But that is not the world we live in. Most of the few comments were useful. A small fraction of prospective commenters also complain to me the commenting system is painful or broken. This blog is a MoveableType blog administered by the University of Minnesota UThink service, so I have very little control over the system. Authentication is aimed to reduce spammers, which it does at the cost of annoying non-spammers (Security is the enemy of efficiency). The Transportationist was never really intended to be a community, though of course it has its partisans. I am not making a living off my blog (or from book sales) so I have not done much in the way of SEO or attempting to drive traffic. My blogging earns no academic credit, it does not appear on my CV, and is probably viewed by colleagues as a distraction or waste of time. At best it earns me fame, at worst, infamy. Given the number of readers (which can be measured in Micro-Grubers), I doubt either is the case. I doubt I got any research projects funded due to blogging. My views are eclectic on the conventional political axes, and so no one is really sure if I am on their team. Articles and Reports – Typically in peer reviewed journals, at conferences, or working papers, linked to on my website. Streets.MN – Approximately biweekly, approximately 1000 words, approximately on something transportation-land use related in Minnesota. Twitter – Public, but short, usually for links … this is where the energy on Linklists has gone. Some have noted that there are a lot less linklists than before. This was about a 1 year experiment. I know it was relatively popular, but the effort was high, higher than it should be due to the wrong tools. In particular, if I read on an iPad, it is a pain to share a link via the blog (my workflow entailed emailing it to myself, loading the link on my desktop, sending that to the blog), but quite easy via Twitter. Since much of my blog reading has migrated to 5:00 am in bed on an iPad, this is how it has worked out. Twitter also gets a twitterfeed from my blog, since by definition, everything I write here I think is link list worthy. There are also a slew of other blogs (TransportationNation, The Other Side of the Tracks, Autoblog, Politico: Morning Transportation, etc.) that do similar link lists (I know a few follow me), so my value-added here is fairly low, maybe catching an interesting article or promoting a story earlier than it otherwise would be. They are paid for this, I am not. Anyway, if you like my curation of links, follow me on Twitter. The reason I do this is mainly for my future reference rather than what I think others are interested in, but if you are interested in some of what I am interested in, it will work for you. Emails (one to one or one to few conversations). I try to keep these as brief as possible. In some cases, down to a single letter (Y, N). If you don’t ask an explicit question requiring a response, you may not get a response. Facebook. I used to automatically feed my blog here, but it stopped. I just it started again with Twitterfeed. I assume most people will ignore or block me. I occasionally comment on someone’s post, or like something. I don’t know why. I occasionally post pictures of the kids, but I am torn between that and Flickr, and lately Flickr gets more love. If I know you in real life, feel free to FB me. LinkedIn. I still don’t know what it is for, but I have lots of contacts. I don’t write here and stopped feeding the blog here when they had some technical issues (posting a picture of Jenny McCarthy with my post). I just started again with Twitterfeed, since there are a few readers there. Feel free to Contact me there. GooglePlus. I send my posts to Google+. I don’t know why, though there are a few readers there. Feel free to Encircle me there. The Transportationist dates from April 2006 (notably post-tenure). So what is the purpose of The Transportationist: It is temporally random, featuring posts of random length but almost always less than 5000 words and often less than 500, generally something transportation-land use related or an announcement of something I or my students have written or edited elsewhere, or a conference, or a talk, etc. In short it is my and my research group’s blog (but I am solely responsible for its content). It is not a community website, or intended for comments generally (in contrast with e.g. Streets.MN), though some posts in the past have drawn quite a few. If you think what the blog says is interesting, follow it. If not, keep calm and carry on. If you have comments, you should get a blog (or if you have one, post there). As someone on the web remarked, that will get a lot more attention for both of us due to Google’s PageRank formula than posting on comments with a nofollow tag. If you think I should post something, feel free to email me, I sometimes posts “A reader writes” type of posts, or “A reader responds”. Let me know if you prefer anonymity from the rest of the world, but I still need to know who you are. Another complaint about comments. I don’t much like anonymous speech (though I understand the need in the case of totalitarian dictatorships, that is not the situation here). Most comments are anonymous. If I ever migrate to a new platform, I will reconsider. As someone said, never read the bottom half of the internet. Also don’t feed the trolls. If you want to get in touch with me, there are lots of channels, frankly too many. Email is probably best. You are smart, you can find it. So if you are still with me, thanks for reading to the end of the post.